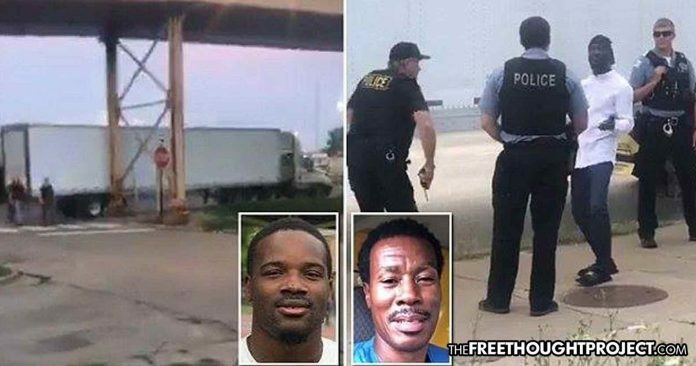 Chicago, IL — Police in Chicago have recently come under criticism for setting up a “bait truck” in a low income area with the intent of enticing people to steal from it. The truck was left wide open with expensive goods like brand new shoes and appeared to be unsupervised. But there were police watching just out of view, waiting to catch anyone who might give into the temptation. Alderman Roderick Sawyer, 6th chair of the City Council’s Black Caucus, pointed out that police in the city have more important things to do than target low income neighborhoods with traps. “This bait truck operation is an unacceptable and inappropriate use of police resources. In a moment where police capacity is clearly under extreme strain, these sort of tactics are the last thing we should be spending manpower and energy on,” Sawyer said. The operation was exposed by local activist Charles Mckenzie who recorded one of the arrests and posted it to his Facebook page. The operation was defended by Susan Terpay, a spokeswoman for the Norfolk Southern Railroad police, who said that these areas were targeted because freight trucks have been burglarized there in the past. “The suspects saw a parked, unmarked trailer and then proceeded to cut open the safety seal with box cutters, broke into the back of the trailer and only then did they find retail shoes in unmarked brown boxes, previously secured and hidden inside,” Terpay said in an email with the Chicago Tribune. One of the people arrested was a deaf man who can only communcate through sign language. When he was arrested he told the officers that he had entered the truck in search of food. Despite the excuses from the Norfolk Southern Railroad Police and the Chicago Police Department, this situation is obviously a clear case of entrapment. Entrapment is a legal term to describe the unethical law enforcement tactic of pushing someone to commit a crime that they otherwise would not have taken the energy themselves to carry out. Entrapment is “the conception and planning of an offence by an officer, and his procurement of its commission by one who would not have perpetrated it except for the trickery, persuasion or fraud of the officer,” according to the legal precedent Sorrells v. United States. Obviously, if this truck was not parked in this neighborhood on this day, it is highly probable that no freight heists would have taken place. The strategy in place by local police seems to be a rudementary “minority report” system which seeks to prevent future crimes by taking “potential criminals” off the streets before they actually do anything. Karen Sheley, director of the ACLU of Illinois’ police practices project pointed out that the Chicago police should be more concerned with the wave of murders that the city has been experiencing. “Police in Chicago must focus on building trust and better relationships within the communities they serve, not engage in stunts like bait trucks. The Chicago Police Department admits that it can’t solve murders and violent crimes because communities of color don’t trust the Chicago police. These stunts won’t help,” Sheley said. The plan was even criticized by Mayoral candidate Lori Lightfoot, who is actually the former head of the Chicago Police Board. “Especially after a weekend with seventy shootings and zero arrests, news of this bait truck operation is an appalling display of misplaced priorities and a step backwards on the path to trust and legitimacy,” Lightfoot said. The operation was eventually called off when local residents realized what was happening and chased the police out of their neighborhood. He raises a good question, it seems highly unethical to leave a truck filled with expensive goods wide open in a neighborhood where people are struggling to put food on their tables. There aren’t many people alive who can resist that type of temptation when they are in a situation like that one.